Submerged aquatic plants are ecosystem engineers that are able to modify their habitat. 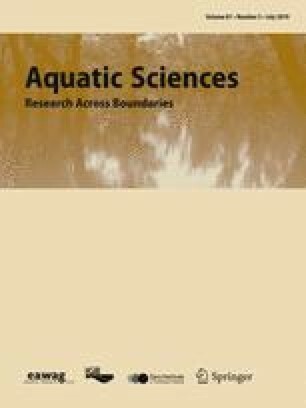 However, the role of patch size in the engineering capacity of aquatic plants has not yet been fully investigated, while it could be essential for elucidating the consequences of plant presence. Our objectives were to investigate the effects of patch size on plant-flow-sediment interactions in lotic ecosystems and to determine whether these effects differed according to environmental characteristics. We performed in situ measurements of velocity and grain size along natural patches of increasing length (L) at two sites presenting different flow and sediment characteristics. Our results indicated that a minimum patch size was needed to induce in-patch reduction of the time averaged velocity component in the flow direction (i.e. streamwise velocity) and fine sediment accumulation. Streamwise velocity decreased linearly with L independently of the site conditions. The sediment texture was instead dependent on site conditions: for the site characterized by higher velocity and coarser sediment, the sediment grain size exponentially decreased with L, reaching a minimum value at L ≥ 1.0 m, while for the site characterized by lower velocity and finer sediment, it reached a minimum value already at L > 0.3 m. This study demonstrated that a minimal patch size is required to trigger the ecosystem engineering capacity of aquatic plant patches in lotic environments and that this capacity increases with patch length. Small patches induce little to no modification of the physical habitat, with possible negative feedbacks for plants. With increasing patch size, the habitat modifications induced by plants become more important, potentially triggering positive feedbacks for plants. The online version of this article ( https://doi.org/10.1007/s00027-019-0635-2) contains supplementary material, which is available to authorized users. We thank Geraldene Wharton for her valuable comments on an earlier draft of this manuscript, Vanessa Gardette, Myriam Hammada, Youssouf Sy and Félix Vallier for field and laboratory assistance and the Compagnie Nationale du Rhône (CNR) for access to field sites. This research was supported by the Research Executive Agency through the 7th Framework Programme of the European Union, Support for Training and Career Development of Researchers (Marie Curie—FP7-PEOPLE-2012-ITN), which funded the Initial Training Network (ITN) HYTECH ‘Hydrodynamic Transport in Ecologically Critical Heterogeneous Interfaces’, N.316546. This study was conducted under the aegis of the Rhône Basin Long-Term Environmental Research (ZABR, Zone Atelier Bassin du Rhône).